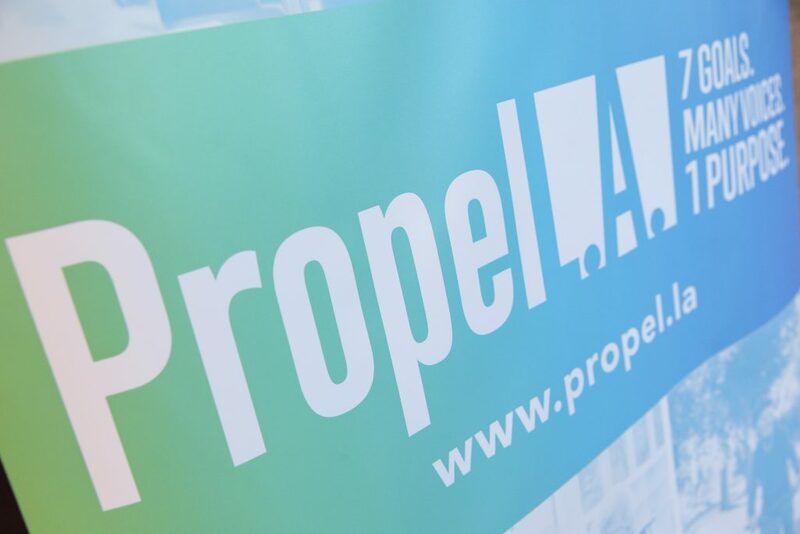 Propel L.A. – the Countywide Strategic Plan for Economic Development – launched last week with a bang! Starting with a surprise flash mob by RAISE Gospel-Pop group, the evening continued with energy, excitement, and a fun propeller launch! Bill Allen, LAEDC CEO, welcomed everyone to the festive evening, sharing thoughts of the successful collaboration among partners leading to the development of the 2016-2020 Strategic Plan for Economic Development, its seven (7) goals, and the Propel L.A. team. The Propel L.A. team is dedicated to the implementation of the Plan, working with internal and external partners to see the 30 objectives and 105 strategies successfully executed. The evening continued with inspirational challenges to get involved from Marianne Haver-Hill, Executive Director, Propel L.A. Raul Anaya, President Greater Los Angeles, Bank of America spoke of the critical need for financial institutions to support the Plan and the crucial role fulfilled by banks and sponsors. President William Covino, CalState LA, inspired everyone with the progress of CalState LA students and the programs offered by the university to assist in student success. He discussed the tools utilized attributing to the university being named number one in the nation for raising students in the lowest 20% of income to the highest 20% of income – a great achievement and one we’re proud to say represents our region. The symbolism of CalState LA’s national recognition directly relates to the work we hope to accomplish through Propel L.A., as we seek to accelerate social mobility, and increase opportunity and prosperity for all LA County residents. 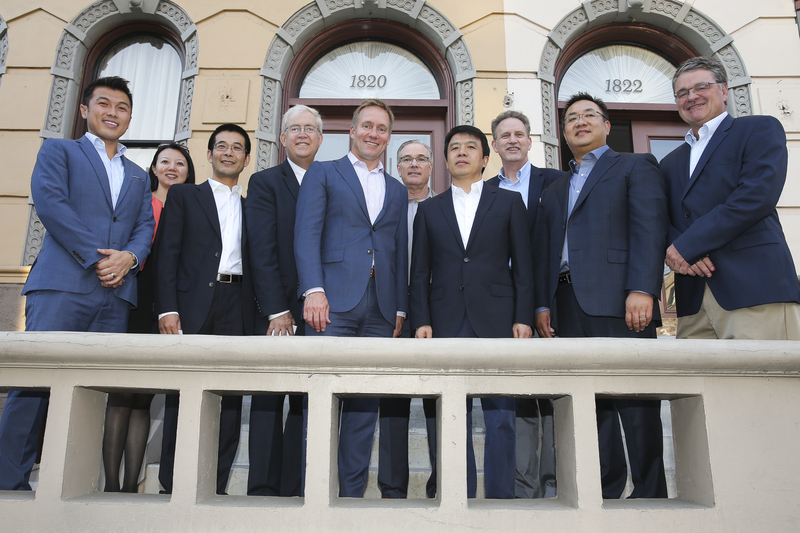 Sachi Hamai, LA County CEO, discussed the county’s work and efforts in economic development and the strategies it is undertaking to accelerate economic opportunity throughout the region. We also enjoyed the viewing of the new Propel L.A. Goals video, which is available for stakeholder use (visit our new YouTube channel). Our drone video provided a symbolic send-off into 2020. The evening continued with bright, neon Propel L.A. propellers launching to the top of the Luckman Fine Arts Complex (at least in some cases)! Join us in the work! There is a lot of hard work to be done in LA County. With the recent release of homelessness numbers, noting a 23% increase in the number of homeless individuals in the region since last year, and increasing housing costs, we owe it to our communities – and to ourselves – to expand industries that provide good paying, living wage jobs, and to prepare our workforce for the new tech-based economy. We have a lot to do, which we look forward to doing together, as we Propel L.A. forward! 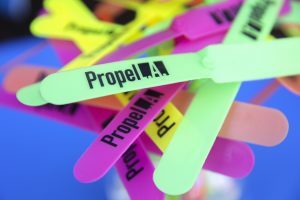 Visit www.propel.la to be notified of when the new web site launches.